Capacity:12/130 Capacity:30/185 Bearings:4+1 12 Lbs. Nuovo BASSPRO TOURNEY SPECIAL (MANOVELLA A SINISTRA) L'ennesimo mulinelo di BASS PRO che presenta un rapporto stellare tra prezzo e qualità, 5 CUSCINETTI a sfera e totale affidabilità.Pomelli in EVA So much technology for such a great price! Sporting a sleek and durable charcoal graphite finish, plus our proven Smart Cast anti-backlash technology, featuring both inner and outer centrifugal brake systems to give you total control of the cast from beginning to end, virtually eliminating backlashes. 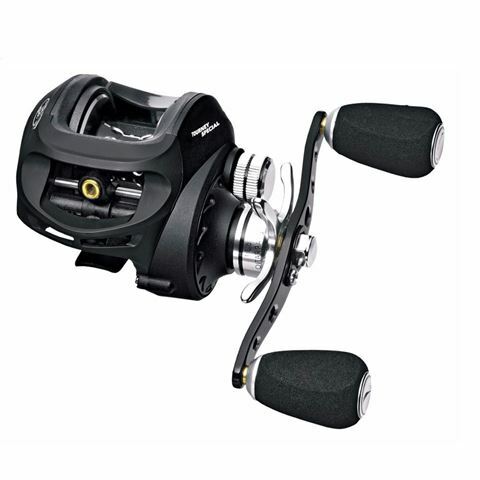 Features a graphite frame; 5-bearing system; Powerlock™ instant anti-reverse; Recurve handle; EVA knobs; recurve drag star; forged, double-anodized-aluminum spool.